Passed April 10, 2019, peacefully, dearly-loved wife of the late Tommy, a much-loved mother, grandmother and granny great. Service of thanksgiving for the life of Pat to be held at 11.00 a.m. on Tuesday 16th April at St. Comgalls Parish Church, Rathcoole and afterwards to Roselawn Crematorium for 1.30 p.m.
No dark clothing by request. No Flowers. 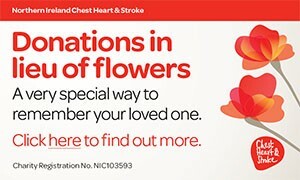 Donations in lieu of flowers, if desired, to St. Comgalls Parish Church Building Fund c/o Wilton Funeral Service, 298 Shore Road, Newtownabbey, BT37 9RW. I am sorry to tell you that Patricia (Pat) PALMER has passed away.